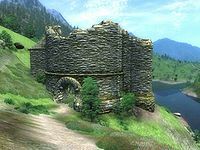 Fort Caractacus is a small fort north of the Imperial City containing conjurers (quest-related). 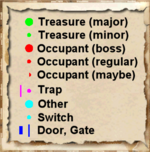 It contains only one zone, Fort Caractacus. This location's map marker (M on map) is named Fort Caractacus (editor name FortCaractacusMapMarker). The entrance door is SW of the marker, 260 feet away. 1-2 Animals (invisible; non-respawning) are near the entrance. 2-5 additional invisible animals are located further away (outside of the displayed map). 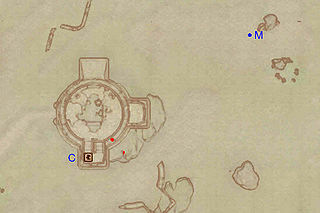 There is an alternate entrance located west-southwest of the main fort, within the ruins of another tower. 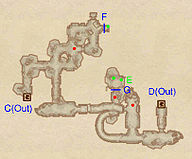 For a Conjurer lair, Fort Caractacus is surprisingly small and fairly linear; while you will most likely enter the fort through the locked entrance found in the exterior ruin (D), an alternative path is available by entering from door C. Either way, with the exception of the intersection in the southeastern area where a tunnel leads underground to locked door (G), hiding a chest and some low level equipment (E), simply explore the fort systematically and make sure to unlock the Gate at F, where there is the biggest chance of finding valuable random loot in the chest.